The new chemicals legislation proposed by the Swedish government has been marketed as an effort to reduce the use of hazardous chemicals in our home environment. The proposal unfortunately misses crucial points in how to achieve this and instead of distinguishing between hazardous substances, it targets certain functions that are perceived as particularly risky – one of which is flame retardants. In an attempt to be progressive the Swedish government has managed to equally punish all flame retardant technologies, including some halogen-free technologies that are generally viewed as safe. The consequence is a failure of the legislation to drive change. The legislation will instead likely create a locking in of existing technologies. Paxymer has been involved in the debate regarding the new chemicals legislation. An initial article in SvD, one of Swedens leading daily newspapers, during the summer sparked the debate. 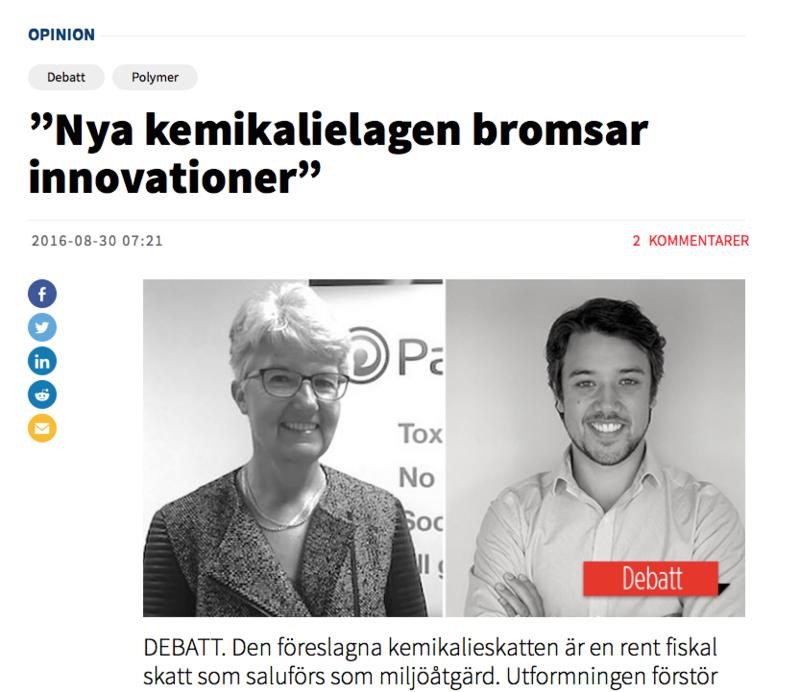 In the latest NyTeknik, Swedens leading weekly technical magazine, Amit Paul, Managing Director and Ann-Christin Paul, Chairman of the board proposes some simple points on how to improve the legislation’s environmental effects. Paxymer proposes three simple changes to the legislation that will increase its environmental impact and potentially achieve substitution of hazardous chemicals for better alternatives. Shift the focus away from functionality and focus on hazardous substances. Use existing classification systems as a base for the taxation. This will minimise sub-optimisation and simplify follow-up. Create a clear timeline/deadlines for when and what substances will be taxed. It is not too late to amend the legislation and make it more functional. These changes would give the market incentive to use less hazardous substances and Sweden would once again drive the agenda towards the use of more sustainable technologies. However it requires a pragmatic debate from the industry and resolute action from the Swedish politicians. It’s not too late.